A’s Place is now open and it is better than ever! Formerly the old Manayunk Diner, new owner Adrienne Cater, is putting her touch on this Manayunk mainstay. Known for it’s fabulous “diner” menu available all day long, she has transformed it into a fine dining restaurant and also a comfortable bar/lounge. Planning a party? Spacious and comfortable rooms are available for your special event. Conveniently located at the southern entrance to the Manayunk District at 3720 Main Street between the movie theater and the Wine & Spirits Store, you can’t miss ’em! 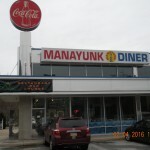 There is plenty of FREE parking and that is a huge benefit in Manayunk! Need to know more? call them at 267-385-5506 or visit their website www.asplacerestaurant.com. Need cash??? ATM service is available! Bridgid’s Restaurant & Bar in Fairmount!